"Costume designer and UC Santa Cruz Theater Arts alum, Christina Dinkel just graduated six years ago but already has a very impressive resume. From designing costumes for top local theater companies, including Santa Cruz Shakespeare and the San Francisco Museum of Modern Art, and Z Space, to several productions at UCSC, Christina is living her dream life." 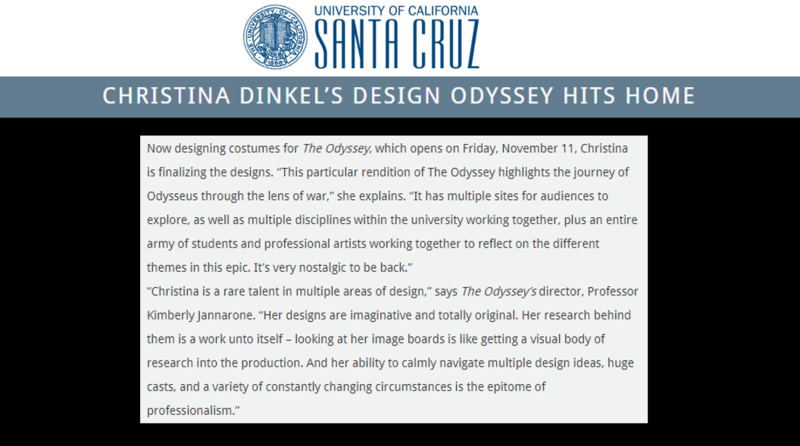 " 'Christina is a rare talent in multiple areas of design,' says The Odyssey’s director, Professor Kimberly Jannarone. 'Her designs are imaginative and totally original. Her research behind them is a work unto itself – looking at her image boards is like getting a visual body of research into the production. And her ability to calmly navigate multiple design ideas, huge casts, and a variety of constantly changing circumstances is the epitome of professionalism.' "
"The Theater Arts Department invites audiences to a collaborative adaptation of the ancient Greek epic in an experiential, multi-venue presentation. Homer's The Odyssey began as an oral narrative, sung by a bard to a friendly assembly, a musical story told to strengthen shared communal bonds and inscribe history into memory. Our artistic team honors this tradition by created a living series of performance "islands" (tableaux vivants, installations) to answer the project's core questions: What does it mean to be a hero? How do we define the rules of society and how do we view those of societies different than ours? How do we interact with different cultures, and what are the roles of women, heroes, and "others" in our contemporary world? The Odyssey entwines in its storytelling its culture's history, nostalgia, fears, aspirations, violence, and moral values. Our project looks at how these issues still charge today's art and literature. The play begins in a transformed space inside the Mainstage Theater, launching Odysseus’ 10-year journey at sea. We move to the Digital Arts Resource Center (DARC) and adjoining spaces, where spectators will be tempted to listen to the Sirens, risk their lives with Circe, and linger with the Lotus Eaters. The event concludes in the Dark Lab black box theater, where we find Odysseus returned home but forever changed."